The preschool operates year-round, enrolling 30 children between the ages of two and six. The youngsters, all of whom are Jewish according to halacha, are divided into two groups according to age. If space were available, said the director, the preschool probably could develop a market of about 40 youngsters. They have tried to find larger, more modern premises, but an appropriate facility is difficult to obtain. The preschool employs two teachers, one of whom is from Israel and the other is a graduate of Beit Chana in Dnipropetrovsk. Additionally, a student teacher from a Chabad pedagogical college in Israel does her practice teaching at the preschool. Families pay a monthly fee for their children’s lunch, but the preschool is tuition-free. A few families, said the director, help the school in various ways. Almost all youngsters go on to Or Menachem day school after completing the preschool. 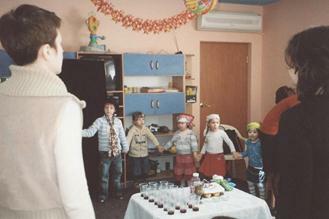 Children prepare for Shabbat on Friday at the Chabad preschool in Donetsk. Ties and hats were distributed to boys, head scarves to girls. The girls pretended to light candles and everyone drank grape juice. Shabbat songs were sung. 46. It is common in Ukraine and Russia for Jewish organizations to form and then embark upon a long and difficult search for appropriate operating premises. The opposite situation may be occurring in Donetsk where space has been found for a Hillel student group before Hillel has officially organized in the city. For reasons that remain unclear, Donetsk – notwithstanding its fine academic institutions – was excluded from the list of almost 30 post-Soviet cities in which Hillel student groups were organized in the 1990’s. Youth groups engaging students meet at both the Jewish Agency and at Jewish community center programs organized by the Joint Distribution Committee, but no Hillel organization has been formed. In the last few years, the newly-strengthened Hillel in Dnipropetrovsk began to include Donetsk students in some of its activities. In recent months, both Donetsk students and JDC began to explore the possibility of using a small abandoned building close to the JDC building as a youth center. The neglected structure was under the very loose supervision of JDC. Over time, it had become filled with trash. After confirming its availability, students completed a laborious process of removing accumulated debris and renovating the structure. A lavatory was installed, and furnishings were acquired for its large single room. Students began to meet in their new quarters. Pressure began to build on Hillel for seed money, which was obtained. Although Hillel was not yet formally organized in late March at the time of the writer’s visit, it appeared that the once-abandoned building would soon be home to an official Donetsk Hillel group. A newly-organized Hillel group in Donetsk will be among the very first in the post-Soviet states to have its own building. 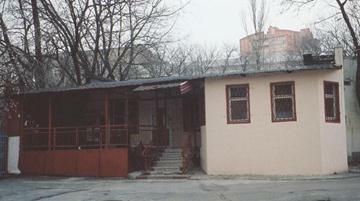 A former nursery school, the structure at right now consists of one large renovated room and a lavatory. However, additional space in the rear of the building remains to be cleaned; it may provide additional program space. 47. 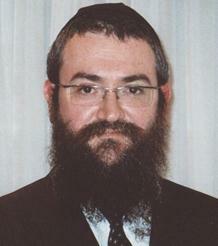 Rabbi Pinchas Vishedski, a Chabad hasid from Israel, arrived in Donetsk in 1994 and immediately began to develop a network of services for local Jews. Nine other Chabad rabbis and their families have joined him in the city; further, Rabbi Vishedski has supervised the posting of additional rabbis in nearby smaller Jewish population centers, such as Luhansk, Mariupol, and Makiivka. A great increase in Jewish community activity has occurred in recent years, Rabbi Vishedski told the writer. Many individuals have come forward as Jews and a large number of them, not only wealthy people, are eager to participate in and assist the community in whatever way they can. The congregation has grown, so much so that the existing synagogue is too small to accommodate all those who would like to come to Shabbat services. Rabbi Vishedski currently is negotiating with municipal authorities about the acquisition of new property in the same neighborhood on which a new synagogue could be built. He noted that a recent Purim celebration was held at the local dolphinarium; all 1,000+ tickets were sold within four days. Further, said Rabbi Vishedski, community activists organized the entire event; earlier in the year, Jewish activists had organized multiple community seders on their own. Donetsk is no longer a “Soviet” community waiting for direction from above, he said. People, especially younger individuals, are willing to give their time, money, and enthusiasm. Their conduct is evidence of a “big revolution” in Ukraine. Nonetheless, he continued, although local Jews are willing to participate in community activities, they still remain hesitant to accept leadership responsibilities. His younger brother, Rabbi Vishedski noted, is a Chabad shaliach (emissary) in Basel, a city with a Jewish population of about 4,000 – and a highly organized Jewish communal infrastructure with multiple organizations and committees. When a Basel Jewish leader came to Donetsk on a business trip, Rabbi Vishedski arranged for him to speak with Donetsk Jewish activists about leadership and assuming leadership roles. Rabbi Pinchas Vishedski, left, is successful in his role as Chief Rabbi of Donetsk. A Board of some 15 individuals, each of whom contributes a minimum of $6,000 annually, provides some general guidance and support to the local Chabad infra-structure, said Rabbi Vishedski. These individuals cover about 65 percent of community expenses, he continued; the remainder is contributed by Yechiel Eckstein’s International Fellowship of Christians and Jews, the Israeli government Heftzibah program in support of Jewish studies teachers, Lev Leviev, and certain overseas individual donors and organizations cultivated by Rabbi Vishedski or people working on his behalf. The total budget for the Chabad infrastructure is $1+ million, Rabbi Vishedski said. In response to a question, Rabbi Vishedski said that Rabbi Eckstein’s organization provides a monthly food parcel distribution to about 200 impoverished Jewish youngsters and also supports some youth social programs. About 200 children also received credits of approximately $80 at a local store so they and their families could purchase new clothing. Donetsk, said Rabbi Vishedski, does not have as many wealthy Jews as Dnipropetrovsk, so very large gifts from individual local donors are unusual. Rabbi Vishedski’s own welfare programs support a soup kitchen offering hot meals to 45 people daily. Approximately 35 such clients come each day, and the remaining ten places are occupied by a rotating larger group of somewhat less needy individuals, each of whom comes several times each week.